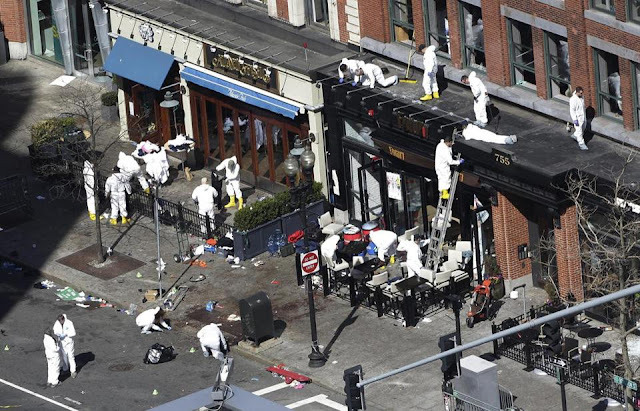 If you followed the news reporting on Monday after the bombing on Boylston Street, you would have noticed some very sloppy journalism and wild speculation. While some leeway can be given in times of crisis, the false reports coming out of places like the New York Post and cables news figures's Twitter feeds went well beyond that leeway. Today's "reporting" has shown why outlets like the New York Times and the major networks are still the king of clean and polished reports for breaking news. While outlets like CNN and AP and Boston.com were reporting that a suspect was in custody and heading to the courthouse, the Times and the major networks held off on reporting this. There is a major breakthrough in the marathon bombing case, as investigators have used Lord & Taylor CCTV to identify a suspect's face in the bombing. Investigators have a face and a name for the marathon bombing suspect and an arrest is imminent. The suspect is in custody and is heading to the Moakley Courthouse in South Boston. Of course, this led to everyone scrambling to get to the courthouse, amassing outside. Then a bomb threat was relayed to the courthouse, causing a massive evacuation made much more logistically complicated thanks to all of the reporters who were there on false reports of a suspect in custody. It was a microcosm of shoddy journalism complicating legitimate law enforcement activities. A shameful one, at that. I lump in all of the cable news networks together. If you're a right winger, you watch Fox News. A leftie? MSNBC is where you head. Stuck in an airport? CNN. The one thing all channels have in common is that they are driven by ratings over journalism and are not legitimate sources of good, hard information. I will take this time to call out the Twitter account @BuzzFeedNews. Tweets like "Police SUV with dark tinted windows just pulled around to the back." or "WCVB: Van back into U.S. Fed. courthouse." are just asinine. Yes, law enforcement vehicles (including tinted SUVs and vans) can be found outside of a federal courthouse, sometimes moving, on any day of the year. To report this as some kind of significant news event is borderline predatory for pageviews and retweets. One thing it cannot be categorized as is news. A friend of mine made a good point today. Assume that CNN or some other outlet was first in getting the scoop of an arrest. Next week, most people would forget who had it first. 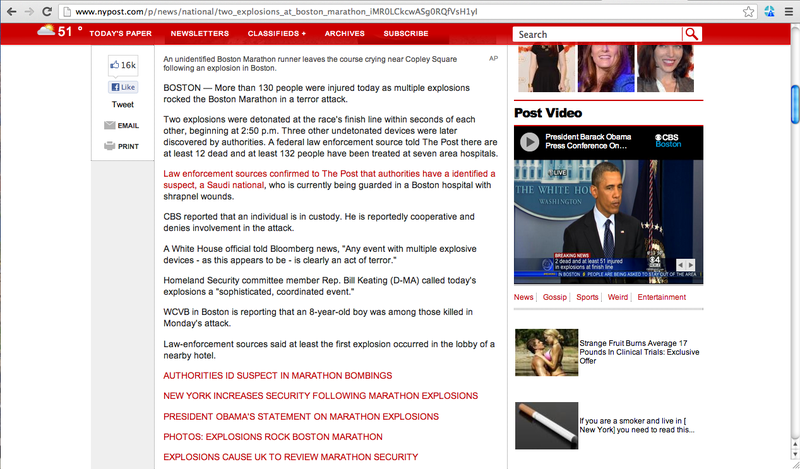 But everyone will certainly remember when CNN blasted "SUSPECT ARRESTED" on their website. They'll remember CNN anchors excitedly saying that an arrest has been made in the case. People don't forget that kind of misstep. So what do we know? Well, for one, CNN learned absolutely nothing from their healthcare misreporting less than a year ago. We learned that for some reason, executives still view CNN as an industry-leader in the breaking news category. We learned that Wolf Blitzer and Jon King should not be on air during breaking news events. Unless you're interested in the relatively mundane traffic patterns outside of the Moakley Courthouse, @BuzzFeedNews probably isn't a good feed to follow. And when someone cites "a source," wait until clearer reports come out, preferable with a named official, before taking something and running with it.